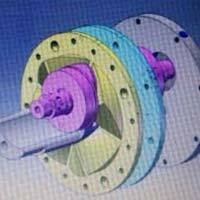 A continuous rotary 3D variable volume concept is being utilized as a pump, compressor, turbine and rotary internal combustion engine. Its best utility comes when used as an engine. 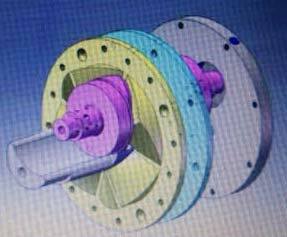 Though it is rotary, it is not centrifugal force based. 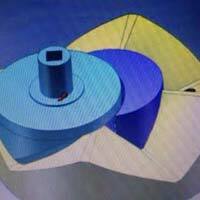 It is RPM independent and positive displacement based system. 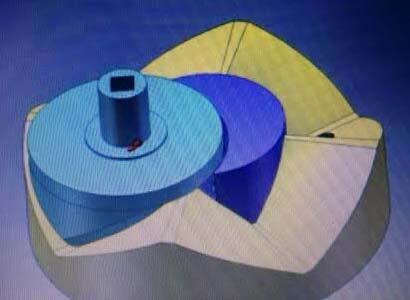 It has no eccentric rotations as in Wankel engine or reciprocations as in piston cylinder engine. It is an all 4 stroke split cycle engine. This engine has a set of interlinked chambers one is a cold chamber and another a hot chamber; intake and compression strokes occur in the cold chamber continuously and simultaneously; while, power and exhaust strokes occur in the hot chamber. So when cold chamber is made larger than the hot chamber turbo charging is a natural outcome, no extra system for turbo charging is required. Best ratio of compression and power volumes may be optimized for obtaining best thermal efficiency. Power stroke takes place every 900, so power strokes are 8 times smaller & smoother to that of a reciprocating piston engine. It can be used as a true hub engine. Kinetic energy restoration system (KERS) : All the essential parts of the engine are rotatable, some are rotatable when wheel is in motion; while, others (never in contact with the road) are rotatable when the breaks are applied to the wheel; as a result, motion of the wheel only gets transferred and not killed when the breaks are applied, and this un-killed motion is transferred back to the wheel when the breaks are released from the wheel, thus, giving a boost to the motion, and minimizing gear shifting and increasing the efficiency of the engine.